Last month, Jazmine Paredes’ husband was arrested on a probation violation and is sentenced to spend seven weeks in the county jail. About once a week, Jazmine attempts to take her two toddlers to visit their father. But she is often turned away. Multiple studies have shown that in-person jail visits are crucial to the reentry process and reducing recidivism. In addition, prison visits help reduce inmate depression. For decades, the SLO County Sheriff’s Department posted visitation times online and at the jail, and permitted family members and friends to arrive 45 minutes early to request a visit. Generally, within a few minutes of the posted time, visitors were allowed to enter the visitation room where the inmates would be waiting. Several years ago, the sheriff’s department began requiring people to schedule a visit online at least 48 hours before the requested visit. On the sheriff’s department website, visitors are instructed to arrive 15 minutes early in one paragraph and 30 minutes early in another paragraph or risk being turned away. 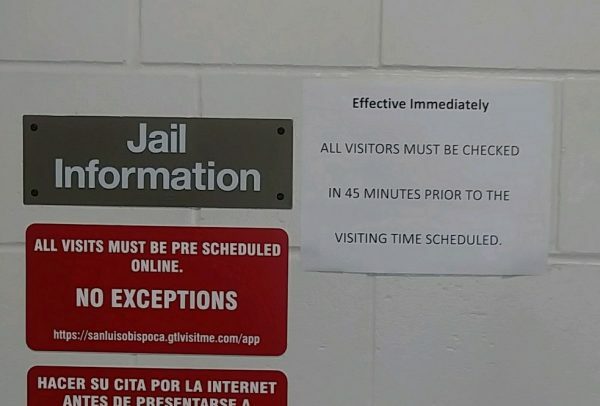 However, at the jail, staffers have posted a paper sign that demands visitors show up 45 minutes before their appointment time. Reporters watched as staffers chastised visitors for not abiding by the rules posted on the sign and refused to allow their scheduled visits regardless of how far the visitor had traveled. When questioned about the lack of consistent rules, sheriff’s department officials noted plans to change the wording on the website to match the sign in the jail lobby. For those who are 45 minutes early, they are then forced to wait in line outside the visitation room for up to 30 minutes past the appointment time. Inside the visitation room, visitors can then wait another 45 minutes for jail staffers to bring in the inmates. “In the event an inmate is brought to the visiting area late, the correctional technicians allow the inmate to have their full time for the visit,” Cipolla said. At multiple visits observed by reporters, only a few family members and friends of inmates attended the visitations. 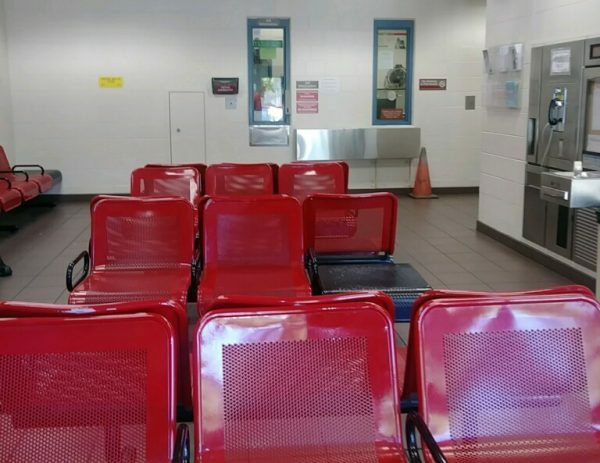 Before the new polices were implemented several years ago, the waiting room was often crowded with people waiting to visit a friend or family member. County jails in California utilize both visitations by appointment and open visitations. Of nine area counties, four require setting appointments and arriving early: San Francisco County requires visitors arrive 10 minutes early, Napa County requires 15 minutes, Santa Cruz County requires 30 minutes and SLO County requires visitors show up 45 minutes early. In both Ventura and Kern counties, appointments are not needed and visitors are not required to arrive early. In Monterey County, visitors are required to show up 30 minutes early for open visitations. Santa Barbara County allows both visitation with and without an appointment, though visitors are required to arrive an hour early. Over the past five years, multiple jails in California, including the SLO County Jail, have began offering Skype-like video visits leading some counties to replace in person visits with the electronic visits. 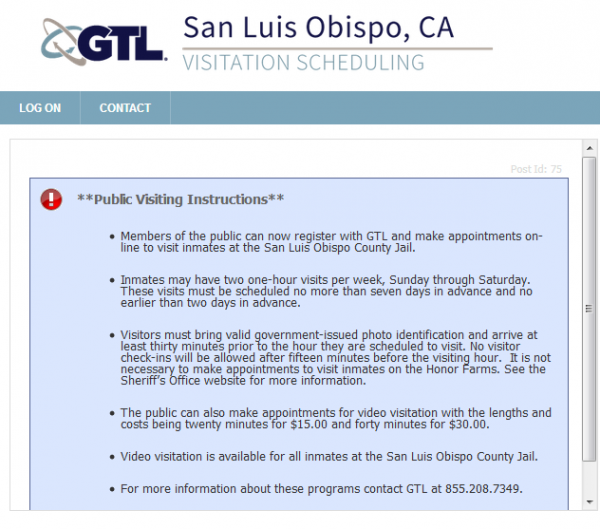 GTL, the company contracted to work with the SLO County Jail, charges $15 for a 20 minute visit and $30 for a 40 minute visit. Multiple inmate advocates have argued against moving away from in-person visits because of the benefits in the visits have on increasing the percentage of inmates’ who successfully reenter society. In June 2017, California lawmakers approved a budget plan that that does not permit county jails to restrict face-to-face family visits for inmates. The measure prohibits county jails that offered in-person visitation as of Jan. 1, 2017, from converting to video-only visitation. In addition, jails are not permitted to charge for the first hour of video visitation. Why show up early? My understanding is a lot of contraband, esp drugs, are smuggled inside. I support the visits, don’t get me wrong. I also think there should be job training, education, and public payback like cleaning freeways. Pulling the weeds, cleaning graffitti, etc. Since the liberals say so many are non violent. Just make sure to have 1-2 white guts on each prison work crew. When a civilian visits it is video or behind glass with a phone. So who is smuggling? My experience (it is thru the son of a friend) is that LEO are really hard on those who are out on parole and just looking for ways to re-incarcerate them. Minute infractions (many inadvertent) are enough to land someone back inside. At our expense. I wonder if this applies more frequently to those, like my friend’s son, who are non-violent offenders and therefore easier targets. It seems like what we should be doing for people whose socialization skills are wanting, is to improve those skills, rather than pushing them further into anti-social behavior. The current methods of dealing with perpetrators of crime seems to be the opposite of what is in the interest of society or our sound financial health. We could be sending someone to an Ivy League university for what we pay to incarcerate them. And what we get in return is hardly a bonus. It is usually someone with even less social skills, even more crime skills and an even larger grudge. Other countries who have actually entered the 21st Century handle things very differently and the result is far, far less recidivism. Actual productive citizens are usually the outcome. This proves to be enormously less expensive to the tax payers and a lot better and safer for their societies. But hey, who cares about that. I think jail as a whole should always remain a place that you don’t want to be at and the more we can do to stamp that image into people’s brains the better off we are. There also needs to be an equal dose of rehabilitation as well so men and women leave after paying their debt to society and they’re better equipped to manage themselves financially on the outside. Messing with visitors is a whole new subject in my book. Why are we punishing them by sending them away? And why on earth would they need to show up nearly an hour before walking a short distance to see someone? Thirty minutes wasn’t enough time? Heck, the jail has the schedule well ahead of time. Don’t expect Ian to become a bold innovator in jail management practices, not the sharpest tool in the shed!! !